As software applications and working methods become more innovative, demands on your underlying IT infrastructure increase. Employees want to utilise video conferencing and fast, remote access to the network without having their user experience impacted. Thankfully, we provide a large range of IT infrastructure services that you can choose from to enhance your system speed and remote access. The tricky part is choosing the right configuration for your business. At Nouveau, we analyse your working environment and business objectives, before designing a free-flowing, simplified network that delivers the right balance of speed, accessibility, reliability and security. We can offer cloud-based infrastructure, on-premises hardware, or a hybrid configuration to provide the best solution for you and your budget. As well as our large range of infrastructure management services, we are also able to offer a range of services that allow you to benefit from our dedicated data centre – with none of the associated costs and hassle of running one yourself. Our southern data centre is located within a purpose built ex-Ministry of Defence UK facilities, which are ISO 27001 accredited, fully PCI DSS v3.0 compliant and IGSoC, HMG-CESG and G-Cloud certified. Our facility is staffed 24/7/365 by security, technical and network staff. 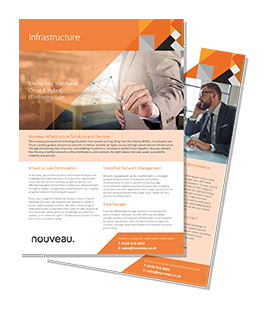 Download our brochure on IT Infrastructure & Network Management. We’ve been a Microsoft Gold Certified Partner for many years implementing Microsoft technologies for customers – such as Office 365, Windows Server, Microsoft’s own public cloud, Azure, and HyperV in Windows Server. We bring the best of what established technology companies, like Microsoft, can offer to your business, with the benefit of local, personal support with our managed network services. After reviewing your specific system criteria, we’ll specify, install, monitor and maintain your on-premises hardware. Whether you want to keep everything in-house, or opt for a hybrid model, using cloud-based services like disaster recovery or data back-up, we’ll make sure your hardware is up to date, protected, and is specified at the right level to do the job you need it to. If you need more bandwidth, storage capacity, or want to introduce flexible working, then virtualisation is the ideal solution. Using an optimal combination of servers, virtual switching and data centre-based infrastructure, we can create an integrated system for your business that’s efficient, and will easily scale as your needs change. You can choose a hybrid model: keeping part of your IT on premises, and selectively choosing aspects for virtualisation to suit. We have a range of managed network solutions to help you with your growing storage requirements. We can help you store more on your existing SAN by using compression technology, and we can provide additional, secure storage capacity through our data centre. From back-up to a full business continuity plan, we can make sure your company’s stored data is safe, and accessible when you need it. If you already own your own server hardware, but need remote data centre provision, we offer a colocation arrangement where your equipment is held within our secure data centre. We maintain your servers in the same way we would if we owned the hardware, and you get remote secure access through our secure platform. If you’re purchasing new hardware, or migrating servers from another location, we can offer advice for the most efficient setup within our data centre environment. Remote desktop gives you the ultimate in flexible working for your employees, with the peace of mind of robust security and access protocols. We can set up a remote desktop environment for your organisation, ensuring each end point device has the right authentication, so your system is safe, and your employees have the flexible working environment they need, either when in the office, or travelling. We’ll work with you to determine the best way of connecting your multiple sites from a technology standpoint. The final configuration will depend on the scope of your WAN, your geographical location and spread, plus the level of security, bandwidth and connection speed that you need. We’ll take all this into account before proposing a WAN design that works with your strategy, office locations, and end-user expectations. Your local area network (LAN) forms the foundation of your wider on-premises and cloud-based systems, and ideally will be a seamless continuation of all the speed, security and capacity measures you’ve taken elsewhere. When we design your LAN, whether VLAN, WAN, or WLAN, we consider your wider network environment, your users’ application demands and your own business requirements and budget. Whether you are accessing a public cloud, private cloud, or need direct communications between multiple sites, we’ll design and install the connectivity technology that meets your requirements the closest. We have expertise in MPLS, SIP and wireless connectivity, plus data cabling services. On top of recommending the technology that best suits your business, we’ll liaise with your telecoms provider and oversee the entire installation on your behalf. Providing strategic input, Nouveau were able to help roadmap our IT needs, and associated cost-benefit analysis as part of the initial steps and longer-term planning going forward. Various solutions were considered, but we recognised the need to have external input in order to convey best practice.